Paris (AFP) - Gunmen killed more than 120 people in a wave of attacks across Paris, shouting "Allahu akbar" as they massacred scores of diners and concert-goers and launched suicide attacks outside the national stadium. Investigators said at least eight attackers were dead by the end of the violence -- the bloodiest in Europe since the Madrid train bombings in 2004 -- with seven of them having blown themselves up. 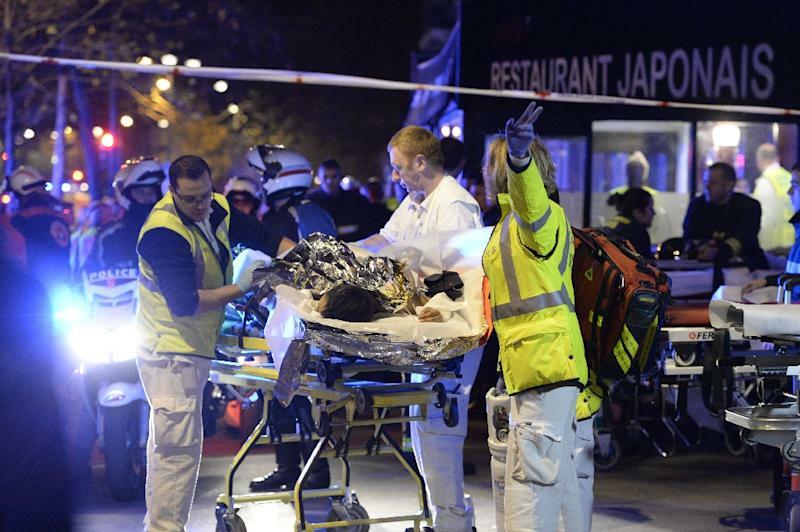 Witnesses said the attackers at the Bataclan shouted "Allahu akbar" ("God is greatest") and blamed France's military intervention in Syria as they sprayed bullets into the crowd watching US rock band Eagles of Death Metal and took dozens hostage. Three of the militants blew up their explosive vests as police stormed the venue, which lies just 200 metres (yards) from the former offices of Charlie Hebdo magazine that was targeted in January. The fourth was hit by police fire and blew up as he fell. "There was blood everywhere, corpses everywhere. We heard screaming. Everyone was trying to flee," said Pierre Janaszak, a radio presenter who attended the concert and hid with several others at the venue. Several nearby restaurants were also targeted, with reports of militants opening fire on Cambodian and Japanese restaurants, leaving many dead in a busy nightlife district. In the north of the city, three more suicide bombers blew themselves up outside the Stade de France national stadium where France were playing Germany in an international football match, security sources said. President Francois Hollande was attending the match and had to be hastily evacuated. 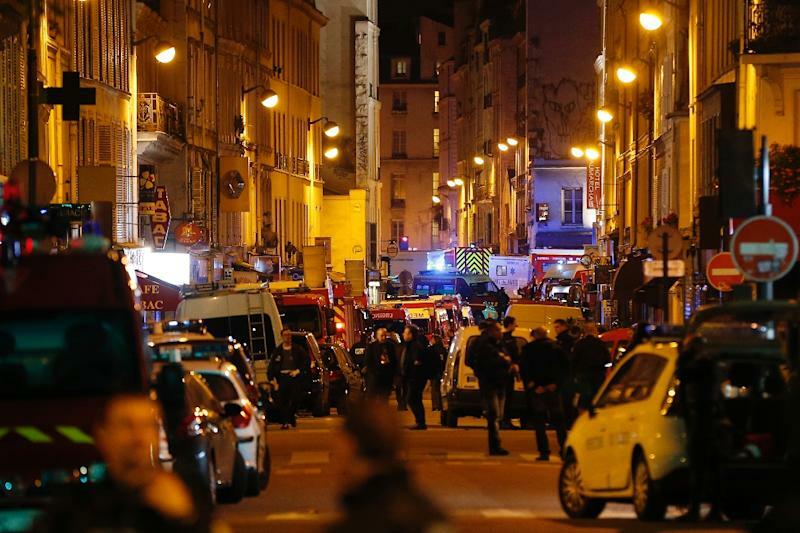 An eighth attacker blew himself up in Boulevard Voltaire near the concert venue, as the streets of the capital were filled with the sound of police sirens and convoys of ambulances shipping the injured to hospital. "Terrorist attacks of an unprecedented level are under way across the Paris region," Hollande said in an emotional televised message. He declared a state of emergency across the entire country and cancelled his trip to this weekend's G20 summit in Turkey. 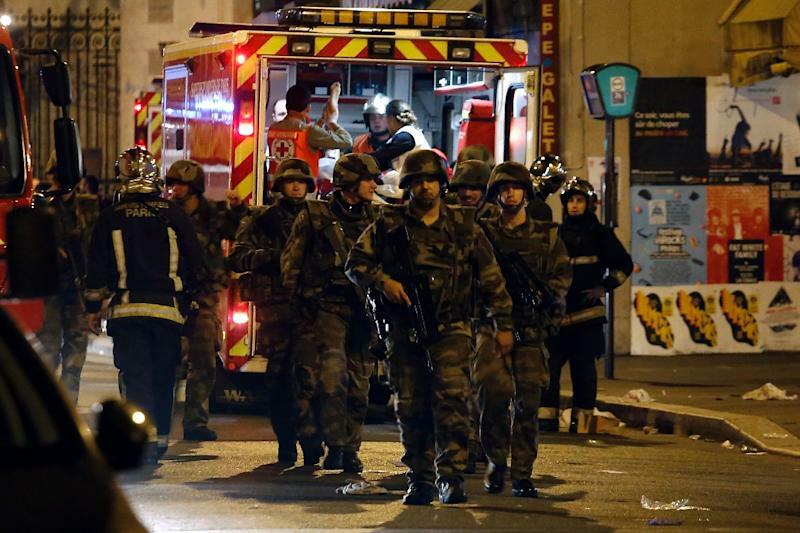 The most bloody of the attacks was at the Bataclan, where police said around 100 people were killed. "We heard so many gunshots and the terrorists were very calm, very determined," Julien Pearce, a reporter for France's Europe 1 radio, told CNN while the hostage crisis was still underway. Other witnesses told French media how the attackers forced people to lie on the floor and then sprayed them with bullets, shooting at anyone who tried to flee. Pearce said friends were still inside as he spoke. "They are hiding in some kind of room in the dark and they text(ed) me, and they are very afraid, of course, and they are waiting for the police to intervene, but it's been over two hours now and this is terrible." Hundreds of police had gathered outside and armed officers eventually stormed the venue at around 2335 GMT, accompanied by a series of explosions. Police decided to launch the assault "very quickly because they were killing everyone," said a source close to the investigation. An extra 1,500 soldiers were mobilised to reinforce police in Paris, Hollande's office said, while mayor Anne Hidalgo urged residents to stay at home. US President Barack Obama led a chorus of global condemnation, saying it was "an attack on all of humanity", and New York lit the World Trade Centre in the red, white and blue of the French flag. German Chancellor Angela Merkel and European Commission chief Jean-Claude Juncker said they were "deeply shocked" by the attacks. France has been on high alert since the attacks in January against Charlie Hebdo and a Jewish supermarket that left 17 dead. Security had begun to be stepped up ahead of key UN climate talks to be held just outside the French capital from November 30, with border checks restored from Friday. More than 500 French fighters are thought to be with Islamic State in Syria and Iraq, according to official figures, while 250 have returned and some 750 expressed a desire to go. France has joined US-led air strikes on IS targets in Iraq for over a year and in September began bombing the jihadists in Syria. French media reacted with horror but determination to the scenes of devastation in several locations in Paris. "War in central Paris," splashed centre-right daily Le Figaro, with Le Parisien taking up a similar theme.